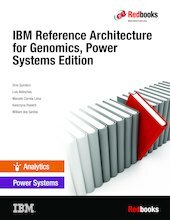 This IBM® Redbooks® publication introduces the IBM Reference Architecture for Genomics, IBM Power Systems™ edition on IBM POWER8®. It addresses topics such as why you would implement Life Sciences workloads on IBM POWER8, and shows how to use such solution to run Life Sciences workloads using IBM Platform™ Computing software to help set up the workloads. It also provides technical content to introduce the IBM POWER8 clustered solution for Life Sciences workloads. This book customizes and tests Life Sciences workloads with a combination of an IBM Platform Computing software solution stack, Open Stack, and third party applications. All of these applications use IBM POWER8, and IBM Spectrum Scale™ for a high performance file system. This book helps strengthen IBM Life Sciences solutions on IBM POWER8 with a well-defined and documented deployment model within an IBM Platform Computing and an IBM POWER8 clustered environment. This system provides clients in need of a modular, cost-effective, and robust solution with a planned foundation for future growth. This book highlights IBM POWER8 as a flexible infrastructure for clients looking to deploy life sciences workloads, and at the same time reduce capital expenditures, operational expenditures, and optimization of resources. This book helps answer clients' workload challenges in particular with Life Sciences applications, and provides expert-level documentation and how-to-skills to worldwide teams that provide Life Sciences solutions and support to give a broad understanding of a new architecture.